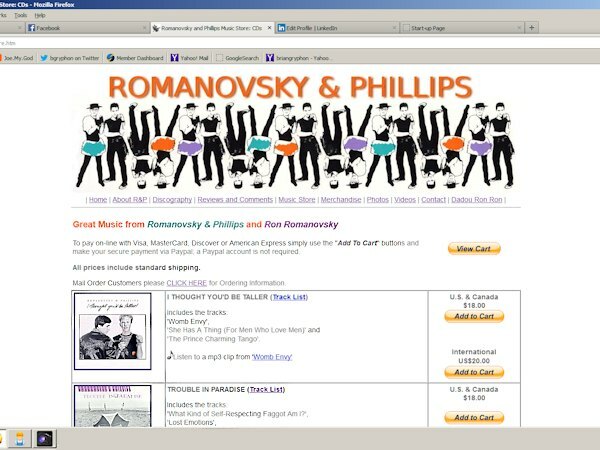 Romanovsky & Phillips began their career at San Francisco’s Valencia Rose Cafe in 1982 as the musical break for Gay Comedy Open Mic Night before touring North America for almost two decades. Although the site’s Store works, the site design was looking dated and the site was missing important content. The new Home Page is shown here. The old page, a “splash screen” using an image map for navigation is not only dated, it could be difficult to navigate on smaller screens. Inside pages lacked consistent navigation; most having just one or two links. Many pages used tables with variable widths; very effective when most computer monitors varied in size by only a small percentage. As more people use extra-wide monitors, content on the Discography and Store pages spread out and became more difficult to read. The site was missing the latest releases and the About section needed updates. The site had a few mp3 files of short clips; the client decided they wanted more and longer clips. These were added, but only on the Store page to encourage shopping. Without having any visitor statistics the redesign intentionally skips fancy tricks (and Flash) in favour of basic html. The site is accessible in most browsers; desktop, laptop or mobile devices. As the site will not likely need regular updates, a blogging platform was not used. As an aside, sites using such systems seem to attract nefarious types. Coloured backgrounds are now less popular; white makes most images pop and avoid the difficulty of light text on darker backgrounds that may be rendered very differently in various devices. At the same time, using artwork from the duo’s original 1980s tour t-shirts for the header inspired a great colour scheme underscoring the spirit of hope and fun R&P brought to their concerts and recordings. Although the header is large, it is the major branding element. The same logotype has been adapted to the official Facebook page and is featured on new apparel and merchandise with a retro look. The client requested a site that did not require frequent code/ plug-in updates yet easily updated when needed (and once current visitor stats are available). 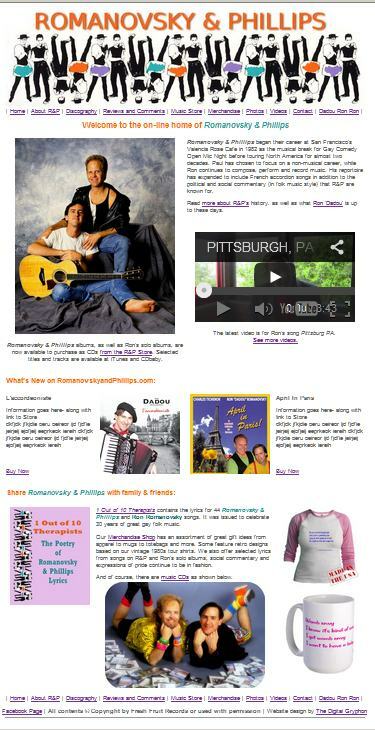 Our redesign used most of the original site’s content, with some new content as provided. Multiple design concepts were reviewed and revised; total billable hours just over 50. 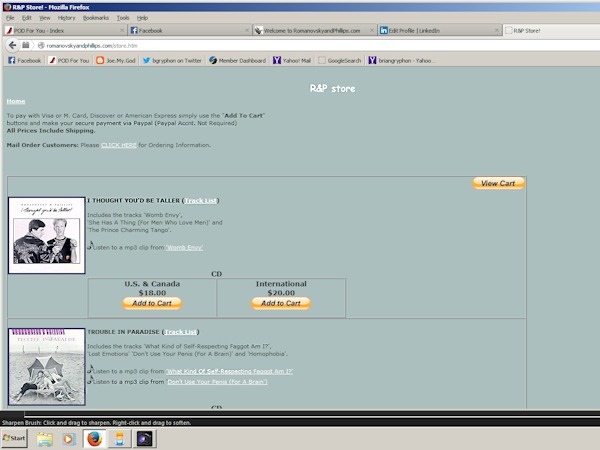 Below are the original and revised Shop Pages.